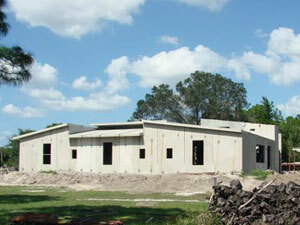 S & S Precast, Inc. 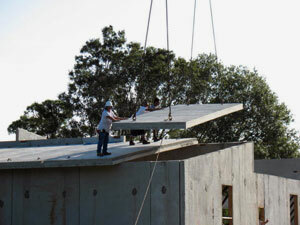 List of Products from S&S Precast, Inc.
S & S has been manufacturing precast products since 1979. The Company began manu-facturing for the Florida Department of Transportation and other county and city governments in 1988. Its Quality Control employees are ACI and FDOT certified. Currently, S & S is limited to making 24" x 20" T Beam of the available sizes in the market. Generic information is illustrated and detailed in the FDOT Standard Drawings, Index. We have provided this product for commercial and county projects. The most commonly used strand is ½" 270 LoLax cable, however, ½" special, 9/16" or .6 strands have been used when higher level of prestress is required. Debonding of cable is a technique widely used in the manufacture of this product. The standard mix is a 5000-PSI design with a water ratio of 0.42 or less. Other mix designs have been used when specified. These mix designs range from 6000, 7000, and Class V Special. A target slump of 3" is a standard. Standard grade 60 rebar has traditionally been used for this product; however, S & S has made this product with epoxy rebar and Varigrid. 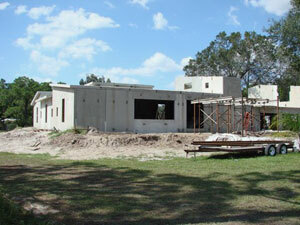 Varigrid is a weld wire product by Ivy Steel, which is approved by FDOT as a substitute for rebar. MMFX steel is available for aggressive environments. 1. Super Plastersizer - Super P is routinely used to obtain a working slump of 5" for concrete with a l" normal slump. 2. Fly Ash - This product is available upon request or as designed by the engineer for record for a project. A mix design would be submitted for approval. This product increases the density of the concrete, which in turn gives longer live, and corrosion resistances. Design would be submitted for approval. This product increases the density of the concrete, which in turn gives longer live, and corrosion resistances. 5. Fiber Mesh - This product is available upon request or as design by the engineer of record for a project. A mix design would be submitted for approval. Corrosion of steel reinforcing bars. This protective treatment diminishes scaling, spalling, and subsequent delamination. Sampling and testing will be done by S & S Quality Control Personnel per S & S Quality Control Plan. All personnel are to be ACI or FDOT certified. All in house testing equipment will be certified yearly by out side lab. Currently, S & S is limited to making Type II, Type II Mod, and Type III beams of the available sizes in the market. Generic information is illustrated and detailed in the FDOT Standard Drawings, Index. We have provided this product for the FDOT, commercial and county projects. The most commonly used strand is ½" 270 LoLax cable, however, ½" special or 9/16" has been used when higher level of prestress is required. Debonding of cable is a technique widely used in the manufacture of this product. The most common strand used is 1/2" 270 LoLax. Strand sizes range from 3/8", 7/16", ½", & ½" special.. Hence, the size of strand and pattern are depending on the product and its application. The standard mix is a 5000-PSI design with a water ratio of 0.42 or less. A target slump of 3" is a standard. 3. Silica Fume - This product is available upon request or as designed by the engineer of record for a project. Mix Design would be submitted for approval. This product increases the density of the concrete, which in turn gives longer live, and corrosion resistances. We can make a wide range of slabs in width, depth, & length. Additional, the slabs can be voided or solid. We are able to make channel and box sections. Deck slabs may have posttensioning system; weld plates or exposed rebar to tie the units together with topping concrete. Each project has its own variations from skews, utilities, sidewalks, & barrier walls. 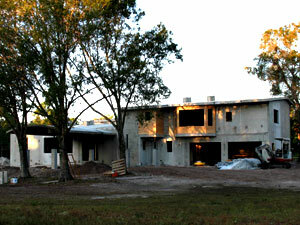 We have made deck slabs for FDOT, county DOT & cities as well as for private developments. Some bridges have had additional architectural panels attach to the sides via weld plates by others. The driving surface can be the deck itself or topped with asphalt or paver brick. The most commonly used strand is ½" 270 LoLax cable, however, 9/16 has been used when higher level of prestress if required. Debonding of cable is a technique widely used in the manufacture of this product. Crown Span™ is a patented design for three sided prestress bridge system. The prestress deck is similar to the deck slabs as used by the FDOT. The other two sided are the legs that the deck rests on. The systems has the look of a box culvert, however, clear spans can be as long as 40'. Maximum leg height is 8", however greater heights can be achieved by the use of pedestal footer. 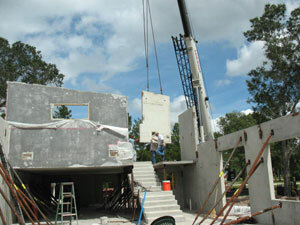 Precast footer and wing walls are an option. If the designer wants a different look other than the box culvert, a curved haunch can be provided. Additional information is available upon request. of prestress is required. Debonding of cable is a technique widely used in the manufacture of this product. The most common strand used is 1/2" 270 LoLax. Strand sizes range from 3/8", 7/16", ½", & ½" special. Hence, the size of strand and pattern are depending on the product and its application. We can make a wide range of products in width, depth, & length. Units may be voided or solid. Units may have posttensioning systems; weld plates or exposed rebar to tie them together with topping concrete. Special additives can be added to enhance the product to prevent corrosion of the reinforcement. Unusual and odd shapes, which are one of a kind, are common for this application. The most commonly used strand is 1/2" 270 LoLax cable, however, 3/8", 7/16, ½" special, or 9/16" has been used when different levels of prestress is required. Debonding of cable is a technique widely used in the manufacture of these products. 1. Super Plastersizer - Under the most commonly used strand is conditions the Super P is used routinely to obtain a working slump of 5". 2. Fly Ash - This product is available upon request or as designed by the engineer for record for a project. A mix design would be submitted for approval before the start of production. 3. Silica Fume - This product is available upon request or as designed by the engineer of record for a project. Mix design would be submitted for approval before the start of production. 4. Corrosion Inhibitors - S & S Structural Systems, Inc. has used several brand name products such as W. R. Grace, DCI; Masterbuilders, Rheocrets; Universal Design, and Ipanex. This product is available upon request or as designed by the engineer of record for a project. A mix design would be submitted for approval before the start of production. 5. Fiber Mesh - This product is available upon request or as design by the engineer of record for a project. A mix design would be submitted for approval before the start of production. 1. Retaining walls - commonly used in conjunction with our bridge units. Generic information is illustrated and detailed in the FDOT Standard Drawings, Index 800 Through 822. 2. Pile Caps - Most commonly used in small projects such as fishing piers, boat docks, etc. Once the concrete pile has been installed the cap is placed on top and grout is used to complete the connection. 3. Pipe Cradles - Very similar to pile caps but used for a utility pipeline in a water crossing. 4. Boat Ramps - This assures the customer of a quality concrete slab, which would be placed under water. Many different designs have been used for the same function. specified. These mix designs range from 6000, 7000, and Class V Special. A target slump of 3" is a standard. Sampling and testing to be done by S & S Quality Control Personnel per S & S Quality Control Plan. All personnel are to be ACI or FDOT certified. All in house testing equipment will be certified yearly by out side lab. S&S has made splice for 14" & 18" using the Sure Lock Splice. These pile when connected exceed over 140'. S&S has made stinger pile for 12", 14" & 18" pile. The most commonly used strand is ½" 270 LoLax cable, however, 3/8", ½" special or 9/16" has been used when different levels of prestress are required. 4. Corrosion Inhibitors - S & S Structural Systems, Inc. has used several brand name products such as W. R. Grace, DCI; Masterbuilders, Rheocrets; Universal Design, and Ipanex. This product is available upon request or as designed by the engineer of record for a project. A mix design would be submitted for approval. Seawall Slabs - This product is reinforced concrete with grade 60 rebar. 1. 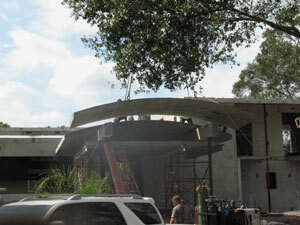 Radius Sheets - when placed together they form an arc - Skyway Bridge, St Pete FDOT. 2. Wedge Pile - in very long runs, a few are required due to creepage. 3. Starter Pile - has a double wedge at bottom and female on both sides. 4. Corner Pile- infinite combinations are available. Typical angles are: 30 , 60 , 90 , and 130 . 5. Square Edge - used with Square Piling when interlocking is not required. The standard mix is a 5000-PSI design with a water ratio of 0.42 or less. A target slump of 3" is a standard. Other mix designs have been used when specified. These mix designs range from 6000, 7000, and Class V Special. 2. Fly Ash - This product is available upon request or as designed by the engineer for record for a project. A mix design would be submitted for approval before the start of production. This product increases the density of the concrete, which in turn gives longer live, and corrosion resistances. 3. Silica Fume - This product is available upon request or as designed by the engineer of record for a project. Mix design would be submitted for approval before the start of production. This product increases the density of the concrete, which in turn gives longer live, and corrosion resistances. S&S makes only one style of stairs; 7" rise with an 11" tread. The width of the stair may vary depending on the project, typically 3'-5'. Maximum number of risers in one unit is 18 steps. Stairs have two types: Type One is a starter unit. This unit sets on the ground level and ends on an upper level. Type Two is a continuous unit. This unit fits between to upper levels. The slabs may vary in thickness between 3.5" to 6" depending on the span requirements. The system is a composite of the prestress and topping concrete with topping rebar for temperature control. Total thickness of the system ranges between 9" to 11" depending on the requirement of the slope, if any. The system is rated as HS-20 or SBC-97 as a parking garage design. The most commonly used strand is 1/2" 270 LoLax. Strand sizes range from 3/8", 7/16", ½", & ½" special. Hence, the size of strand and pattern are depending on the product and its application. The standard mix is a 5000-PSI design with a water ratio of 0.42 or less. Other mix designs maybe used when specified. © 2007 - S & S Precast, Inc.
of any content or portion of this website is strictly prohibited without written permission from S & S Precast, Inc.